George Soper studied at the Royal College of Art and commenced his career as an illustrator at the turn of the 20th Century when he soon built up a reputation as a painter and printmaker particularly of Rural subjects. 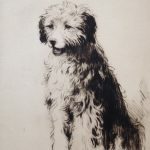 Soper exhibited works at the Royal Academy, The Royal Scottish Academy and in 1920 he became a full member of the Royal Society of Painter-Etchers and Engravers. Soper died in 1942 leaving his two daughters Eva and Eileen his younger daughter and prodigy who became a renowned etcher and illustrator in her won right.